Multidimensional Signal, Image, and Video Processing and Coding gives a concise introduction to both image and video processing, providing a balanced coverage between theory, applications and standards. 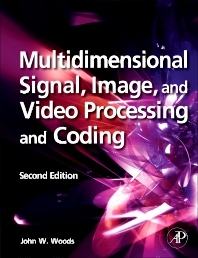 It gives an introduction to both 2-D and 3-D signal processing theory, supported by an introduction to random processes and some essential results from information theory, providing the necessary foundation for a full understanding of the image and video processing concepts that follow. A significant new feature is the explanation of practical network coding methods for image and video transmission. There is also coverage of new approaches such as: super-resolution methods, non-local processing, and directional transforms. Multidimensional Signal, Image, and Video Processing and Coding also has on-line support that contains many short MATLAB programs that complement examples and exercises on multidimensional signal, image, and video processing. There are numerous short video clips showing applications in video processing and coding, plus a copy of the vidview video player for playing .yuv video files on a Windows PC and an illustration of the effect of packet loss on H.264/AVC coded bitstreams.